As part of our regular weekly roundup, Coinsquare News covered the week’s significant international cryptocurrency and blockchain headlines. 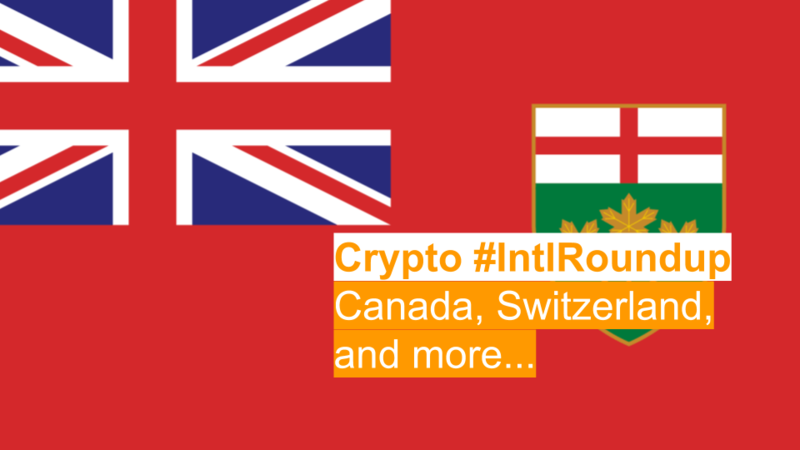 In this edition, we look at local crypto news in Canada, Swiss authorities taking issue with a $121 million CAD ICO, and more. In local news this week, the town of Innisfil, Ontario voted in favour of a year-long cryptocurrency pilot project. The project, which is the result of a partnership with a Toronto-based company, will result in residents being able to pay property taxes using digital assets. The CBC reported that, beginning next month, residents of Innisfil will have the option to pay their property taxes using a cryptocurrency wallet operated by Coinberry Pay. From there, funds will purportedly be converted to fiat currency. Currently, the move is part of a one-year trial that will allow tax payments to be made with Bitcoin. Moving forward, however, residents may also have the option to pay their taxes with other digital assets such as Ripple, Ethereum, Litecoin, and Bitcoin Cash. Lynn Dollin serves as the mayor of the small Ontarian town, which has a population of around 36,000 people. She is reported as calling this new pilot evidence that the town of Innisfil is both innovative and ready for the future. In news pertaining to Switzerland this week, Reuters reported that Switzerland’s financial watchdog found wrongdoing in actions taken by a major Initial Coin Offering (ICO) that operated in the country. The ICO in question was operated by Envion AG. Reportedly, the Swiss Financial Market Supervisory Authority (FINMA) says that the since-liquidated firm accepted over 90 million Swiss francs (over $121 million CAD) without a license. As many as 37,000 investors partook in the multimillion-dollar ICO in exchange for “bond-like” tokens. Among other violations, FINMA claims that conditions surrounding the ICO were not equal for all investors, and that the firm did not uphold its legal requirement to employ internal auditors. According to a recent press release, a blockchain firm and Vietnam’s largest distribution company entered an agreement to establish the country’s first authorized cryptocurrency exchange. Historically, the legality surrounding cryptocurrencies has been somewhat complicated in Vietnam. While trading and holding digital assets like Bitcoin is legal in the country, the State Bank of Vietnam previously made it illegal to use cryptocurrencies as a method of payment. Now, in a collaboration between KRONN Ventures AG, a blockchain company based in Switzerland, and the Vietnamese distribution company Linh Thanh Group, the country is reportedly set to establish a licensed cryptocurrency exchange.